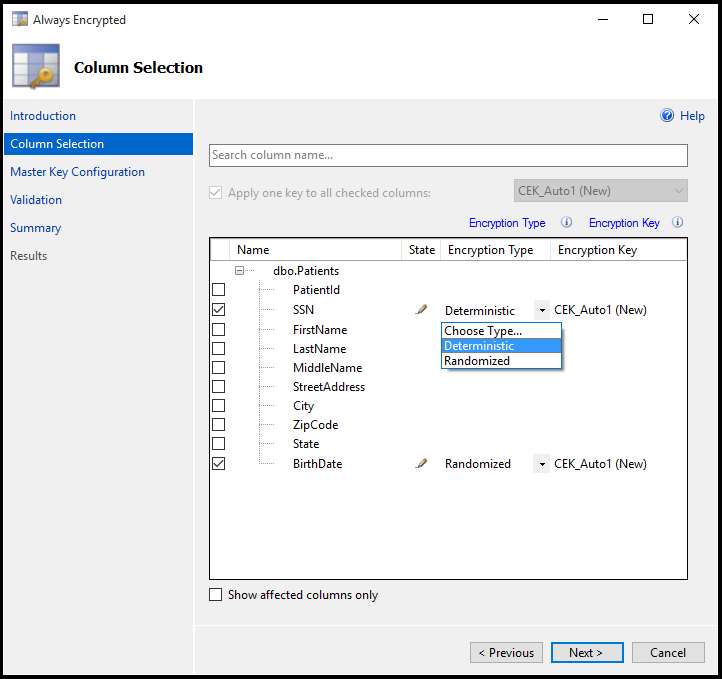 This article shows you how to secure sensitive data in a SQL database with data encryption using the Always Encrypted Wizard in SQL Server Management Studio (SSMS). 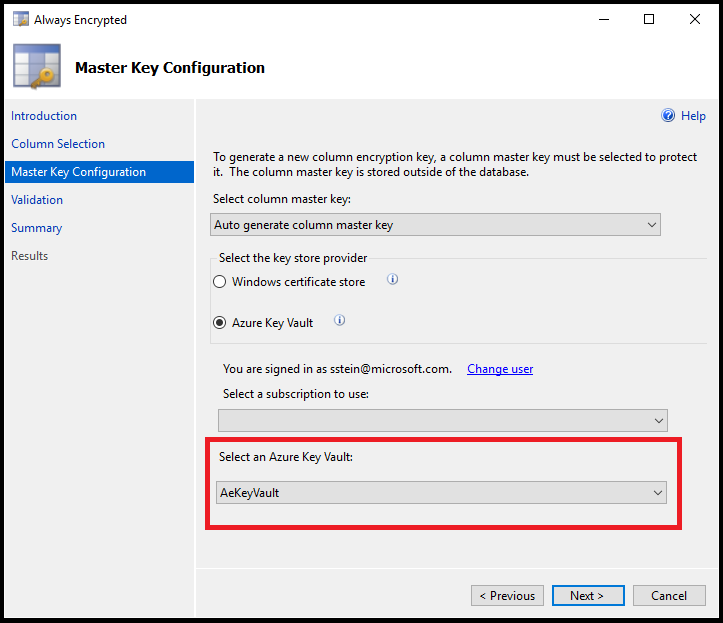 It also includes instructions that will show you how to store each encryption key in Azure Key Vault. Always Encrypted is a new data encryption technology in Azure SQL Database and SQL Server that helps protect sensitive data at rest on the server, during movement between client and server, and while the data is in use. Always Encrypted ensures that sensitive data never appears as plaintext inside the database system. After you configure data encryption, only client applications or app servers that have access to the keys can access plaintext data. For detailed information, see Always Encrypted (Database Engine). After you configure the database to use Always Encrypted, you will create a client application in C# with Visual Studio to work with the encrypted data. 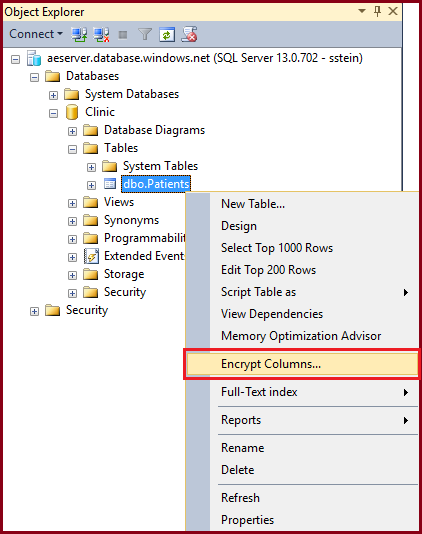 Use the Always Encrypted wizard in SSMS to create Always Encrypted keys. Create a column master key (CMK). Create a column encryption key (CEK). Create a database table and encrypt columns. Create an application that inserts, selects, and displays data from the encrypted columns. An Azure account and subscription. If you don't have one, sign up for a free trial. SQL Server Management Studio version 13.0.700.242 or later. .NET Framework 4.6 or later (on the client computer). You must enable your client application to access the SQL Database service by setting up an Azure Active Directory (AAD) application and copying the Application ID and key that you will need to authenticate your application. To get the Application ID and key, follow the steps in create an Azure Active Directory application and service principal that can access resources. Now that your client app is configured and you have your application ID, it's time to create a key vault and configure its access policy so you and your application can access the vault's secrets (the Always Encrypted keys). 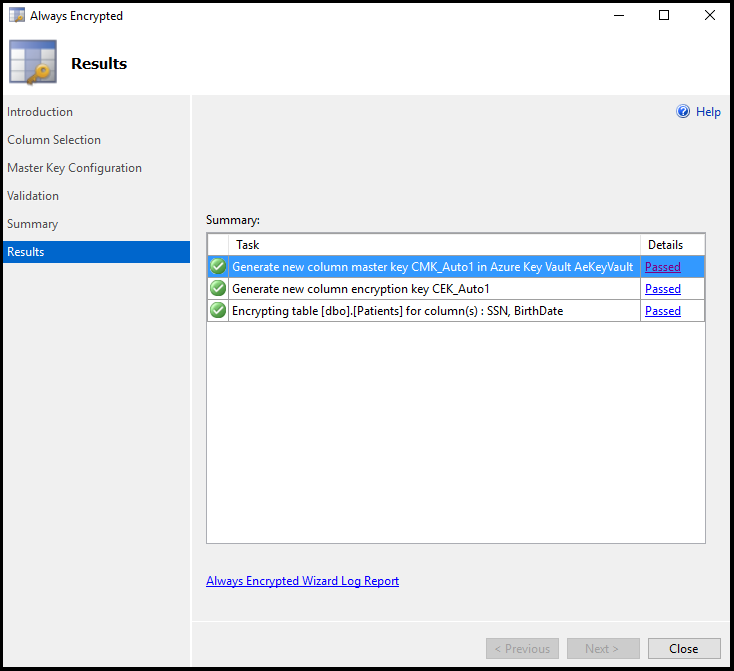 The create, get, list, sign, verify, wrapKey, and unwrapKey permissions are required for creating a new column master key and for setting up encryption with SQL Server Management Studio. You can quickly create a key vault by running the following script. For a detailed explanation of these cmdlets and more information about creating and configuring a key vault, see What is Azure Key Vault?. Go to Create a resource > Databases > SQL Database. Create a Blank database named Clinic on a new or existing server. 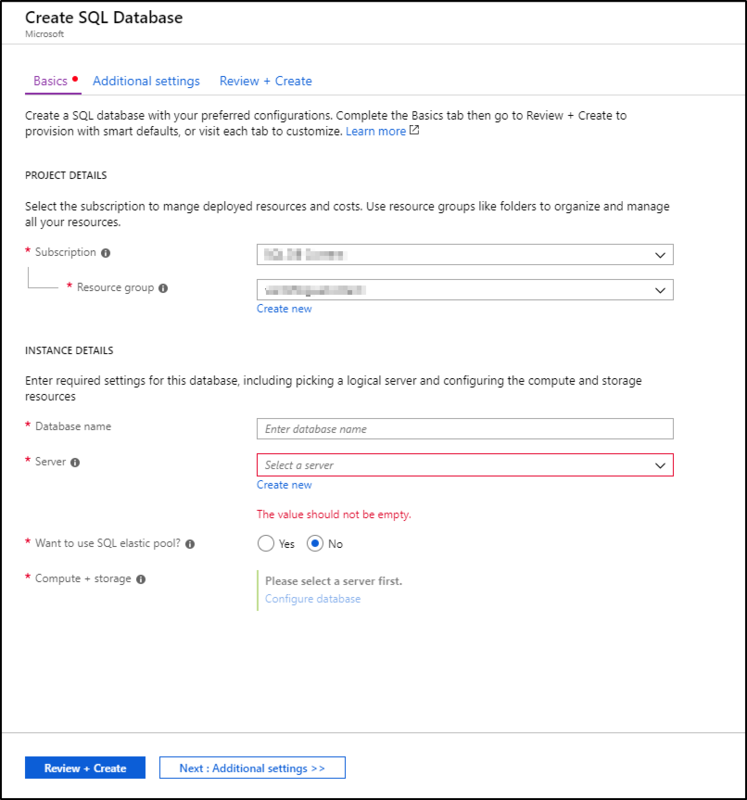 For detailed directions about how to create a database in the Azure portal, see Your first Azure SQL database. You will need the connection string later in the tutorial, so after you create the database, browse to the new Clinic database and copy the connection string. You can get the connection string at any time, but it's easy to copy it in the Azure portal. Go to SQL databases > Clinic > Show database connection strings. Copy the connection string for ADO.NET. Open SSMS and connect to the server with the Clinic database. Enter your server name and credentials. The server name can be found on the SQL database blade and in the connection string you copied earlier. Type the complete server name, including database.windows.net. If the New Firewall Rule window opens, sign in to Azure and let SSMS create a new firewall rule for you. In this section, you will create a table to hold patient data. It's not initially encrypted--you will configure encryption in the next section. Right-click the Clinic database and click New Query. Paste the following Transact-SQL (T-SQL) into the new query window and Execute it. SSMS provides a wizard that helps you easily configure Always Encrypted by setting up the column master key, column encryption key, and encrypted columns for you. Expand Databases > Clinic > Tables. The Always Encrypted wizard includes the following sections: Column Selection, Master Key Configuration, Validation, and Summary. Click Next on the Introduction page to open the Column Selection page. On this page, you will select which columns you want to encrypt, the type of encryption, and what column encryption key (CEK) to use. Encrypt SSN and BirthDate information for each patient. The SSN column will use deterministic encryption, which supports equality lookups, joins, and group by. The BirthDate column will use randomized encryption, which does not support operations. Set the Encryption Type for the SSN column to Deterministic and the BirthDate column to Randomized. Click Next. The Master Key Configuration page is where you set up your CMK and select the key store provider where the CMK will be stored. Currently, you can store a CMK in the Windows certificate store, Azure Key Vault, or a hardware security module (HSM). This tutorial shows how to store your keys in Azure Key Vault. Select the desired key vault from the drop-down list. You can encrypt the columns now or save a PowerShell script to run later. For this tutorial, select Proceed to finish now and click Next. Verify that the settings are all correct and click Finish to complete the setup for Always Encrypted. Created a column master key and stored it in Azure Key Vault. Created a column encryption key and stored it in Azure Key Vault. Configured the selected columns for encryption. The Patients table currently has no data, but any existing data in the selected columns is now encrypted. You can verify the creation of the keys in SSMS by expanding Clinic > Security > Always Encrypted Keys. Now that Always Encrypted is set up, you can build an application that performs inserts and selects on the encrypted columns. 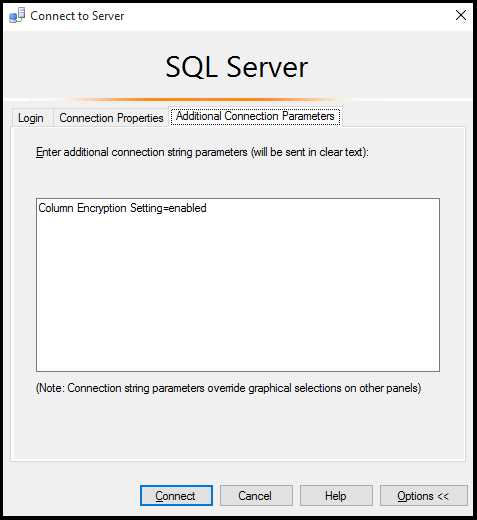 Your application must use SqlParameter objects when passing plaintext data to the server with Always Encrypted columns. Passing literal values without using SqlParameter objects will result in an exception. Open Visual Studio and create a new C# Console Application (Visual Studio 2015 and earlier) or Console App (.NET Framework) (Visual Studio 2017 and later). Make sure your project is set to .NET Framework 4.6 or later. Name the project AlwaysEncryptedConsoleAKVApp and click OK. Install the following NuGet packages by going to Tools > NuGet Package Manager > Package Manager Console. Run these two lines of code in the Package Manager Console. This section explains how to enable Always Encrypted in your database connection string. To enable Always Encrypted, you need to add the Column Encryption Setting keyword to your connection string and set it to Enabled. You can set this directly in the connection string, or you can set it by using SqlConnectionStringBuilder. The sample application in the next section shows how to use SqlConnectionStringBuilder. Add the following keyword to your connection string. The following code shows how to enable Always Encrypted by setting SqlConnectionStringBuilder.ColumnEncryptionSetting to Enabled. The following code shows how to register the Azure Key Vault provider with the ADO.NET driver. Modify your connection string to enable Always Encrypted. Register Azure Key Vault as the application's key store provider. Insert data into the encrypted columns. Select a record by filtering for a specific value in an encrypted column. Replace the contents of Program.cs with the following code. Replace the connection string for the global connectionString variable in the line that directly precedes the Main method with your valid connection string from the Azure portal. This is the only change you need to make to this code. Run the app to see Always Encrypted in action. // Update this line with your Clinic database connection string from the Azure portal. // Enable Always Encrypted for the connection. // Update the connection string with a password supplied at runtime. // Assign the updated connection string to our global variable. // Delete all records to restart this demo app. // Add sample data to the Patients table. // Fetch and display all patients. // Get patients by SSN. // This very simple validation only checks that the user entered 11 characters. // In production be sure to check all user input and use the best validation for your specific application. // that match the provided value and store the results in selectedPatients. // Check if any records were returned and display our query results. Console.WriteLine(selectedPatient.FirstName + " " + selectedPatient.LastName + "\tSSN: "
// This method simply deletes all records in the Patients table to reset our demo. 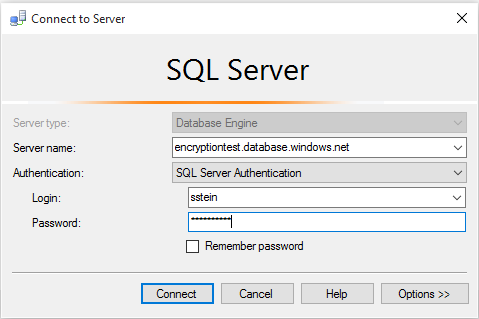 You can quickly check that the actual data on the server is encrypted by querying the Patients data with SSMS (using your current connection where Column Encryption Setting is not yet enabled). Run the following query on the Clinic database. You can see that the encrypted columns do not contain any plaintext data. To use SSMS to access the plaintext data, you first need to ensure that the user has proper permissions to the Azure Key Vault: get, unwrapKey, and verify. For detailed information, see Create and Store Column Master Keys (Always Encrypted). Then add the Column Encryption Setting=enabled parameter during your connection. In SSMS, right-click your server in Object Explorer and choose Disconnect. Click Connect > Database Engine to open the Connect to Server window and click Options. Click Additional Connection Parameters and type Column Encryption Setting=enabled. You can now see the plaintext data in the encrypted columns. Rotate and clean up your keys. Migrate data that is already encrypted with Always Encrypted.